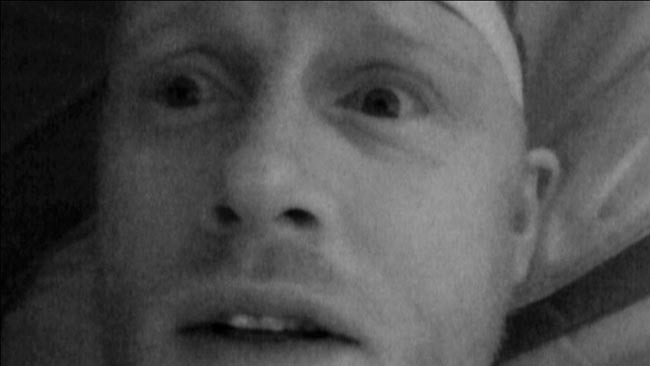 Freddie Flintoff in Alone in the Wild. Photo: Discovery Networks. For those with an objective view of outdoor life and visiting wild places, reality-TV’s grip on ‘reality’ can be shaky at best, an infuriating sham at worst. For example, despite “I’m a Celebrity…” being set in the Australian ‘jungle’, it might as well be filmed in a studio filled with house-plants. Ant and Dec host the show from a miniature suspension bridge. Publicity hungry celebrities seem to be selected on the basis that they’ll annoy each other or get it on, or both. To liven things up a bit, the celebs are periodically subjected to situations and challenges that are a pale imitation of the classic Japanese gameshow Endurance. Which part of this contrivance of a “reality” is actually real? So when we hear there is yet another reality show featuring celebrities facing challenges of the wild, we have good reason to be sceptical. Alone in the Wild is a new 6-part series on the Discovery Channel (not to be confused with this National Geographic show of the same name), where the participants are literally left alone in the wild. I watched the following trailer and thought it all seemed overly dramatic, as TV is often want to do. This sort of hyperbolic ‘man vs nature’ language always turns me off. You don’t fight nature, you work with it. The apparent simplicity of the tasks – finding water, food and shelter – is, however, what gives the premise of the show potential. There have been shows with a similar framework, where celebrities have received some training before being ushered forth into the wilds with a handycam. The best of these escaped the crass superficiality of much of reality TV: For example, the BBC’s Ian Wright in the Kalahari and Jack Dee goes to Siberia, both of which were entertaining but not exploitative. It was difficult to tell if Jack Dee’s trademark grumpiness was authentic or well-practiced but the tiredness in his face was all real. It is this latter level of authenticity which many of use crave from reality TV but rarely receive. The inclusion of Chris Ryan and Aron Ralston interested me in particular. Ryan was a member of the ill-fated Bravo Two Zero patrol and Ralston’s story was dramatised in Danny Boyle’s recent film 127 Hours. All too often we are subjected to novices dumped into unfamiliar situations in the name of interesting television; a cheap and easy way of creating a little frisson. Here, though, amongst this group of personalities, we have two experienced outdoorsmen who have undergone terrific hardships. Watching these two, at least, should interest even the more cynical viewer. Chris Ryan in Alone in the Wild. Notice how organised his camp is. Photo: Discovery Networks. Not only this but the list of participants includes highly accomplished sportspeople, including two olympians. What edge will their physical fitness provide? Will they be able to transfer their ability to keep a cool head under competitive pressure to the pressures of being alone in wild and remote country? Amy Williams and Tanya Streeter in Alone in the Wild. Photo: Discovery Networks. 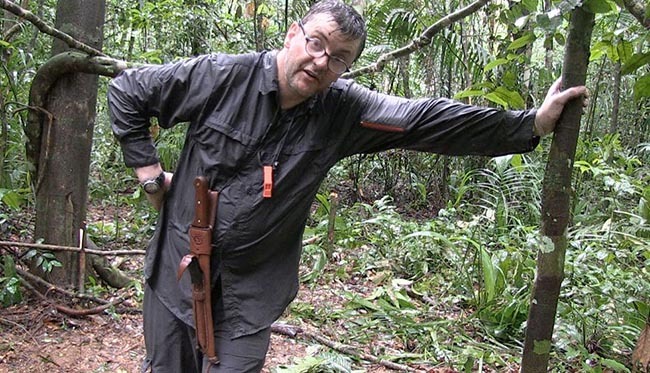 Joe Pasquale Alone in the Wild: "The most difficult thing I've done in my life." Photo: Discovery Networks. The participants were given location-specific training as well as survival equipment. 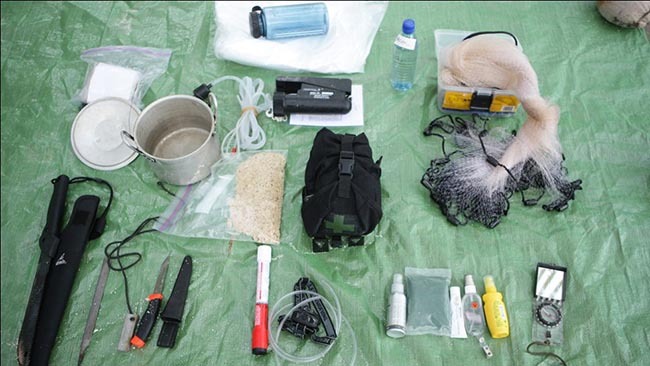 For example the equipment provided to Jason Gardiner and Aron Ralston (both of whom undertook their Alone in the Wild experience in Belize) is shown in the photograph below. They also took an emergency radio and an air horn. Items that Jason and Aron took with them in their Survival Kit: toilet roll, 1 cup of rice, pot, transpiration bags, 1 litre bottle of water, desalination pump, fishing net, flint/magnesium block, large knife, small knife, fishing line, flare, headtorch, insect repellant, hand gel, sun screen, compass, mosquito net, bite-relief cream, first aid kit and a book on reef fish. Photo: Discovery Networks. Having watched various footage from Alone in the Wild, my view is that even if you are not a reader of Hello magazine, there are some reasons to take a look at these shows. There is interest on a practical level – we see what they do and how they do it, even if it is done badly. We see how they prioritise and the effects this has on them. There is interest on a psychological level – we see how they react to certain frustrations, difficulties and potential threats. We also see how they cope with isolation and the video-diary format gives us some access to the participant’s internal dialogue and emotional state. If you haven’t spent time on your own in wild or remote locations then don’t be too quick to judge these people. Some of the participants have never even wild-camped in the UK before. It seems this time we might actually be getting some reality in a reality TV show. Let’s watch this over the coming weeks and discuss it in the comments section. Alone in the Wild, starts on Wednesday October 5th on the Discovery Channel. Very interesting, certainly the inclusion of the folk you have mentioned. I too am totally turned off by the present reality culture, and also the poptastic survival shows of man v nature (hang head in shame bear grylls) this coukd actually show how hard it is, and give a humbling experience not captured on tv often. Agreed – the kit they supplied for the desert island was well-chosen and very useful. Luxury! I have been on the jungke survival course with Ian cradock in Guyana several times! I believe Ian to be the x sas man behind alone in the wild and based around his idear of survival training and then followed by a isolation period. Having done this twice I would believe a good proportion of the program. If you look at bushmasters on Facebook I believe there is photos of Ian and all the cast. In my opinion if Ian is involved it will be as shown, he is a very straight man and relies strongly on his reputation. Thanks for this info. Bushmasters courses/experiences do look interesting. It’s good to hear you found your experiences on them worthwhile. As, you say reputation is everything and, as you’ve just proved, word-of-mouth is very important. Someone take the whip away from the TV execs. I think the dead horse is more whipped than a double cream for a scone. Although interesting as to how these people will cope, it seems TV is oging the way of the pointless and vapid entertainment we now have on mainstream TV. For me it seems like we are dumbing down but also becoming obsessed with pointless ideas for TV itself. Perhaps if people banded together to raise enough money for a decent TV station that does not cater to celeb ego pushing and more on what makes people learn of the world without making it seem like we are all fans of Tellytubbies. That cost is over £2M per year thoug hand it seems out of the reach of many who wish to give us information. Another outdoors show is starting on BBC2 which will interest us all. Wednesday at 8PM (UK) has more celebs but without a map and having to use nature to get to where they need to be. Compared to Alone, this format seems more better as it is not made to be like the “Look I am on TV and I can do this” type of show. The no map or compass and walk to a point miles away seems oto me better than people in remote places pretending to be Les Stroud for the sake of entertainement. I might watch Alone but only for Chris Ryan. At least there you know you can gain some insight into how it can be done and not how to mess it up. The problem TV faces is proliferation. When I was a kid, we had 3 channels and they didn’t show 24/7. Now there are hundreds of channels showing 24/7. Plus we have the internet, where people spend more and more time for entertainment as well as information. There is so much more media now than there ever has been. Much of established TV is scrabbling for a diminishing share of a diminishing pie. The result is lower revenue and lower budgets. People tell me that reality TV is cheap to make. If you throw celebs into the mix, then it feeds into the celebrity-obsessed world we live in. We do band together to pay (via the Licence Fee) for a TV station – the BBC. The problem is, even they feel obliged to compete for ratings. Even though I did watch both, I felt I learned more from BBC2 episide about navigation. Even though Discovery has made a well produced program, the episode did nothing but entertain. I learned more from that “All roads lead home” for navigating around the area they were placed in and some of the pointers were helpful. It would be a good exercise to do what they did by handing out a book with directions and let the people go out navigating. It would give a whole new ideal of exploring the outdoors. It looks to be an interesting programme. Yes it’s staged because none of the celebrities were given adequate training to allow the to cope better or seek out food. Also interesting is it’s not about putting a group of people together that have been selected to deliberately get on one anothers nerves and create friction. Thanks for the article link. It adds some colour and it sounds like Frenddie was not a great student. What I find heartening – if you can believe the article – is that the experience of being close to nature and fending for themselves has affected some of the participants in positive ways they didn’t expect. If, during the programme, they manage to communicate some of these feelings to the viewer, then that can’t be a bad thing. There is potential for some really good show’s there that would satisfy an outdoor enthusiasts requirements for a proper survival show. However, despite this, the footage will, (has been) edited to accommodate the target audience, which are the demographic that enjoy such classics as ‘Mega Machine’s’, ‘Worlds biggest structures’ and so on. Take Ed Stafford’s Walking the Amazon as an example, the book, a fascinating and inspiring read was reduced to 2 hours of arguing and monkey eating, the vast majority of the story was cut out. If you go onto http://vimeo.com/walkingtheamazon , you can see all of the rushes before Discovery go their hands on it, a much better representation of what happened. The bottom line is that Discovery are one of the last TV companies that invest and make there own shows, therefore they take as little risks with them as possible in order to reach the highest rating’s which is accomplished by targeting the lowest common denominator. This is why there were two different edits of the Bear Grylles program, Man vs wild for Discovery, then the same rushes were edited into a different program ‘Born Survivor’ for Channel 4. Needless to say the Channel 4 version was a lot more subtle and less about avoiding death at every turn and more about the actual survival skill’s. Discovery are not the BBC or C4 and they don’t try to be either, they are their own brand and they are well aware of what to do to generate advertising revenue, which lest we forget, is the only reason the program’s are made in the first place. Agreed – a certain section of TV is certainly headed for, if not already at, the lowest common denominator. But there are still some quality shows, with high production values being made – Planet Earth or Human Planet for example. They also cleverly manage to include the reality aspect in the ‘behind the lens’ extras. I think the challenge for TV production is to make nature/wilderness shows that are of high quality and widely-appealing. I hope they will keep trying. In addition to my previous comment, I support Discovery in the sense that not only are they paying my wages at the moment ;-), they are the only TV company investing in Human survival programming. Man Woman Wild – which has an US special forces chap and his cute English wife in a staged survive and escape scenario which when reading between the lines, provides and entertaining and informative view on how survive with the added pressure of having you wife or girlfriend with you, it’s genuinely touching at times and the relationship between them is real. It has all of the Discovery hallmark’s, dramatic music, plenty of life or death type stuff but the patience Mykel Hawke shows with Ruth England and the way they work together is compelling and often amusing. Then we have Dual Survival with Cody Lundin and Dave Canterbury, an excellent clash of characters, a Hippy and Rambo. Obviously selected to provide some entertainment but also the show unintentionally exposes the Rambo survivalists as being not particularly good at surviving and the Hippy insists on wearing shorts and no shoes, even in the Arctic. Be patient with you Wife, she is more capable in the outdoors than you think. The lowest common denominator want to see people drinking piss and eating spiders so that is what we’re going to see more of. Gone are the day’s of instructional bushcraft shows, they simply dont generate the advertising revenue. After watching the clip of freddie trying to light his fire it was obvious that he did several things wrong.. He seems to have left it way too late in the day before even attempting to start his fire opting to erect his shelter first. It looked like there was less than 45 mins of daylight left when he started to erect his shelter, you can put your tent up by fire light!!! His fire lay was totally wrong, what happened to tinder, kindling and small twigs up to small sticks? You could see later in the clip he did try breaking small sticks? As far as i could see there was very little wood to keep the fire burning thru the night. The limb that he dragged into camp would have burnt thru in maybe a couple hours if he was lucky. He did admit later that he did not listen to the instructor very well during the survival training they all recieved BEFORE they went out alone. That the crew was going to come along and make sure his fire was lit before night fall? In the survival items they did take with them there was a flare, did he not think of using that? Im sorry but all the so called reality shows are more for ratings than anything else. The public should be getting off their backsides and doing something more productive with their evenings and switching off the boxes showing these TV compaines that we dont need nor want these “reality” shows anymore. Now show me a reality show where a few of these celbs get eaten by a lion or fall off a cliff / wander in to the GAFA and never return .. ill watch that !! Out of all the crap on tv This show will have many merrits in the fact it shows how experienced folks do stuff and how inexperienced folks mess up. Both good news, no matter if your fresh out of the city or some wild old gnarly tramp whos lived in the same kecks for 30 years in a bush. There are many big shots who’ll say its crap etc blah blah blah. Then theres the experts and some self proclamed experts who’ll say you should have done this or that etc, again, blah blah blah. I believe in questioning everyone and everything as no one has all the answers and some of the finest experts with ego’s to match fill the graveyards of the world. Its too easy to jab fingers when looking from the outside in, but very different when in the actual situation, at that exact time, with those same people in that place and in that heat. What makes me chuckle is that they have a shed load of kit and giving chris ryan anything other than a poke in the eye, a kick between the legs and a crack full of bullet ants before sending him into the jungle simply isnt cricket old chaps. Itll be easy peasy for him with all that kit. What it all boils down to is like the tv dudes comment said, its all about numbers in terms of viewers and pound notes. Sadly the real skills are being cut or diluted in favour of interpersonal confrontations(anyone who watched dual survival series 1 will know what i mean if they watched series 2. Lots of arguing, not many skills.Though Arguing and falling out is a massive part of life and survival in general, sadly the majority of tv viewers favour that over actual practical skills teaching). Good sound knowledge comes in many guises, so its worth a watch. You’re as direct and no-holds-barred as ever! You make some good points. At least we shouldn’t get the interpersonal confrontations with this show. Let’s hope some TV producers are reading your comment – maybe they will take heed…. Interpersonal is a word but, yep arguing will do. Bring back Ray Mears i say. Would it not be possible to have the best of both worlds? also include ?voiceovers saying what mistakes were being made/better ways of doing things that are within the capabilities of the people invoved. eg Freddie Flintoff and his attempts at firemaking could be made really useful – even to the wider target audience – by a simple voice over saying something like – he has not collected enough wood and organised it into tinder/matchstick/pencil thickness /larger wood /thicker timber for the night etc. It was the same with the programme about a year(?) ago on that bloke who went into northern Canada and had to be airlifted out. Interesting, but could have been so much better with some informed/expert comment on WHY he wasn’t catching any rabbits/plants that he was ignoring but which he could have eaten etc. That’s a good point. These days they could even have a debrief/dissection of the participant’s performance on a separate video on their website as an extra feature. I would like to enjoy the programme, BUT have the people doing that they have will I eel ruin the experience, I would find it more interesting with Joe Shmo off the street than these goons who continually do the rounds of trying to get us to invest in there efforts to SURVIVE, there very involvement makes it more a game show than any kind of documentary about the human psyche and the will to SURVIVE, will over dramatic Donald last longer then squeaky Pasqualy? Ofcourse it is entertainment with a serious statement, the modern human has to be tought again how to live and survive in the woods. We have lost many skills. Because living in the woods is hard work. Your daytime job is gathering, preparing and cooking besides hitting your trail or staying at camp. 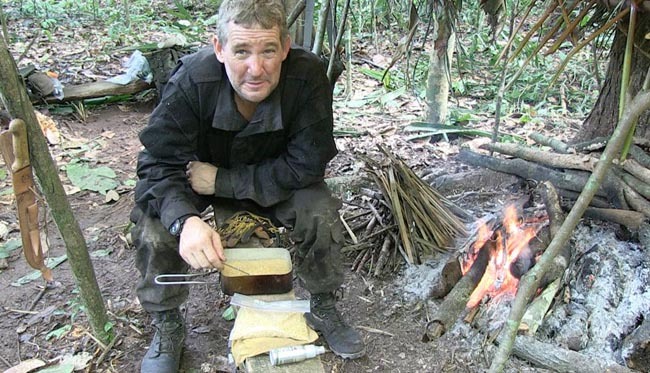 But which program about survival or bushcraft do you commentars like ? I have started years ago with “The Bushtucker man” Les Hiddens.. about wild foods, although in Australia and I am in The Netherlands, it gave me the interest and perhaps the right mindset to look around you, use whats near you. Not just walking through the forests, just open your eyes. Personally I like Les Hiddins shows too. Also I like the earlier shows (World of Survival, Extreme Survival and Heroes of Telemark) of Ray Mears. I also like Bill Mason’s films. They say you learn more from other people’s successes and your own mistakes. But, as Jeremy Beadle prooved long ago, its far more fun watching someone else crash through their glass coffee table than doing it yourself. These shows are entertainment, not education, so don’t be too hard on them. I imaging a lot of people will tune in because they like the celebrity, not because they have any interest in bushcraft/survival. I know Amy Williams keeps my interest in 71 Degrees North! If there is anything “factual” in these shows, then it is probably the psychological element, rather than the survival skills. Most of these celebs are not actors and so the loneliness, anxiety etc, whilst “set up” is perfectly genuine. Another piece of reality tv ! – Having been disappointed by much of what is on the ‘box’ ,even in this genre ,I have learnt to adjust my expectations. I am glad to see television producers are still interested and aware that a good percentage of their viewers have an interest in man’s relationship with ‘The Wilderness’. Much of it is just for celebrity ‘followers’ and tv ratings..But it is interesting in this instance to feature a good cross section of folk from lets say ‘no hopers’ to ‘survivalists’ – the comparisons will be interesting. Undoubtedly , if we look in and around ‘the gloss’ and editing there will be lessons to learn. If the TV producers etc would allow less ‘sensationalism’ , it would be great to see Ray Mears or even Paul Kirtley thrust in to a couple of different environments for 30 days. People are starting to understand the difference between x factor/i/m a celeb reality and ‘everyday reality’. We just need some Bushcraft Reality ! Ah well, it is what it is… more vacuous fodder for the masses. Can’t see why people get so upset about this kind of TV? Watch it if you want, don’t if you don’t want to. Perhaps the best to be hoped from this kind of thing is that it might whet the appetites of the participants. Potential to be a great humbling experience for them which might be lifechanging. Will watch each one with an open mind and take it at face value, I know from personal experience the effects a few days without adequate nutrition have on the body. Have they the will to persevere and struggle on, or will they give up and call for their PA? It’s all about attitude, and insight into human nature. If they thrived then it would be less insightful. If they’d all been trained to live off the land with efficient dogged persistence, then frankly it would all get a bit boring – who wants to watch an hour’s TV of someone “camping”? Although the episode with Chris Ryan is likely to be most interesting for most. The “reality” is that we’ll probably learn less about Chris than we learn about the rest. Good opportunity to remind ourselves that survival is mostly about psychology. Indeed it is what it is. I will watch with an open mind too. I’m a firm believer in everyone having something they can teach you. Mind-set and psychology of survival are key elements. The range of personalities and levels of experience involved in this show should present a range of responses to the various situations. I hope this will make for interesting viewing and provide some insight. If, as a result of their experiences, the participants are more inclined to be more involved with educating people about nature, then this is a good thing. If, by watching celebrities undertake such challenges, viewers are more inclined to get out and lead a more adventurous life, then this is also to be encouraged. Well, that was OK. No idea what the back-up situation is like out there, but he handled the lion proximity very well…. well, at least for the few seconds he managed to do a face to camera monologue. Hearing a lion in such close proximity is no easy thing to deal with when you are on your own in the African bush. It’s a sound that really drives home the fact that it’s possible you could die quite soon in a most primeval way. Utterly terrifying even when you’ve grown up in Kenya with them around you. As to the fire fail scenario, well, I’ve seen it and done it myself many a time even though I know better. You get pressed for time and you cut corners, even though you know failure increases fourfold. His comments on taking his time were only too true and a great learning curve that can only be gained through experience. The thing we must remember is that we love these skills and have studied and practiced them many a time. The people doing this don’t hold that same fascination and won’t do textbook perfect prep. Some of them probably fell asleep at the tutorials whilst vigorously cleaning mud off their Louis Vuitton shoulder bags. Funny thing was, he obviously had an enormous amount of fear when he was hearing those lions, but faced with the elephants he wasn’t as afraid. Truth be told, he was in huge danger then, and was lucky the elephants were quite calm although obviously threatening at the same time. It could well have been different, and the true danger he was in at that point, he seemed almost unaware of. A much better programme than I would have thought Discovery could deliver in this format. The big let down was the lack of snakes and other herpetofauna 😉 . I’ll watch the rest with great interest, especially Ryan and Ralston’s eps. …Hah, Chris Ryan’s fire is hilarious. Typical Regiment! His obliviousness to the danger the elephants posed was quite incredible. I’ll take each one as it comes. I’m guess they are all going to be quite different, given the characters involved. Freddie was quite entertaining but I wasn’t quite sure what I was watching. Despite Freddie saying he wasn’t looking to “go on a journey” but just to see some animals and spend some time alone, he didn’t seem too interested in hunting or fishing either. Was this a survival exercise, or a vision quest ,or just a budget safari? When you go into the wilderness with so much equipment (but no food) it frees up a lot of time you would otherwise have to spend – building a shelter etc – for introspection. Hunger, through deliberate or enforced fasting, is a well known way to heighten your perceptions. It will be interesting to see if any of the other celebs go on a more inward journey or remain very practical. Thinking back to Ed Wardle’s programme, fear, with occasional moments of elation, and loneliness become the dominant emotions. Is this because we have become so removed from nature or just that we are social creatures at heart? An interesting episode…Freddie, clearly , has always ‘ploughed his own furrow’ and this was going to be no exception. His confidence , mental strength and enthusiasm worked for him but could of put him in harms way with some of the wildlife. It shows that the will to survive or succeed is sometimes the ultimate determing factor in any situation. Outside of ‘Freddies Safari’, the first episode and clips from Jason’s adventure showed some fairly ‘cavalier’ use of the machete. A tool like that in the wrong hands could make the ‘contestants’ their own worst enemies. Jason’s attempts to break open the ‘conch’ with his , looked very worrying. Would most UK Bushcraft Schools give their students an axe without proper training and or supervision ? Having watched two episodes of this, my interest is waning. Did Freddie and Jason really do so little in the space of 7 days? Yes I understand the effects of food deprivation but even so, their efforts have been edited down to almost zero and yet still somehow fill an hour. All we got for the first 50 minutes of Jason was melodrama, the creation of which he may or may not be proud. I found his reactions somewhat cringeworthy. He let the rain get inside his head. I wish he’d put out the tarp he had or opened out a transpiration bag to create a large surface area on which to catch rain. If he’d cut through the conch while holding it, he may well have lost a finger. He could have used the coconut fibres for firelighting. Despite his practical shortcomings, his struggle was entirely mental. He then got his sh1t together. The most significant aspect was that he started enjoying his experience. My interest drifted in this one too. I don’t know why folks are so worried about the unsafe use of the machete. The truth is that the thing must have been so blunt after chopping onto rocks and conchs that it would only have caused bruising had it of hit him. Cutting ability long since lost. I’ll still watch the rest. Each programme will be different depending on how the ‘celebs’ throw themselves into the situations. There might still be a couple of gems waiting for us. The second is the complete lack of hopelessness, they are dropped off for a defined period, they could(As Mr Flintoff did) just lay back and drink water, no effort required to wait to be given a grid to exfil too and be extracted from, this one is the biggest problem with the show to my mind, Mr Wardel took upon himself to stay as long as he could, which then paced him firmly in a battle with his own mind and breaking point, where as if he was dropped on the shore and told he will be picked up in two weeks come what may, It wouldn’t have been such dramatic viewing. I understand they have to work within the constraints of budget, schedules and filming allowances, but maybe using Joe Shmoe off the street would have provided a better subject as they may have been able to leave them in the environments longer, or created the scenario to lul them into a mind set enough get them in a survival mind set. Readers might like to check out this mini series from a few years ago on Channel 4, Desert Darlings. http://www.channel4.com/programmes/desert-darlings/4od#2923031 It isn’t a bushcraft or survival situation, rather an expedition (to Namibia). It is also a bit melodramatic. However, for me, watching this alongside Ed Wardle’s programme, goes to show that other people, or the lack of the, can be a massive factor in how people come through these kinds of situations. After watching Aron Ralston’s episode tonight I came to a conclusion. In Aron Ralston we have a man who could not move and had limited resouces and actually hacked off his arm to survive in a real life survival situation. His programme tonight showed him struggling to survive even with with enormous resouces and comfort. Although arguably he was more succesfully than others in the previous programmes. So why the difficulty? I think it’s simply down to the mindset and the fact they are not surviving for real. If in trouble they have backup and rescue and blankets. The human mind cannot switch to primeval survival mode unless life is really threatened. It’s not something that can be faked or coerced for TV. For the full survival instinct to take over, you have to be in a situation that needs it, a last resort. Life or death. As such, these programmes fail. Ed Wardle’s experience in the original Alone in the Wild would no doubt have been entirely different had he really been forced into living wild to survive. He too had that ‘GetMeOuttaHere’ button beside him at all times. He wasn’t surviving, he was passing time until he gave in to the lure of that button and his brain was not switched on to survival because of that. Agreed Paul. People underestimate the shock of learning you are lost. I had to spend a night out alone in the bush, in Ontario, in early May, when I was only 17 years old It was sleet-raining (part snow, part rain), and cold, and I had to stop there and then to find shelter. Camping is all well and good when planned, but alone, and hungry, and tired, and cast upon you, this magnifies the experience. I kept getting awakened in the middle of the night by some ghastly scratching noise outside my shelter. I slept light and frightened, my imagination going wild. Came dusk, I slipped out of the shelter to light a small fire and warmed up. The rain had finally stopped, though I was near hypothermic. As I warmed by the small fire, I heard that distinct scratching sound again. It was a squirrel. I had been afraid of a bloody squirrel all night. I learned to listen to nature more closely after that. The fact is, when confronted by unusual circumstances, your imagination can get the best of you. You can do stupid things and get hurt. Psychology of survival is an important aspect to consider, not just bush knowledge. love your articles. keep carrying on. With Reference to the product offering on your Site,May I know If you need hunting Clothing&Military Uniform,Supplies from CHINA.